If you’ve been reading these daily bracket recaps — since you’re reading this one, I’ll assume you have — you probably picked up on a recurring formula. Typically, the author compliments the voters when their votes correspond with the author’s personal taste, and admonishes them when they don’t. As we’ve gotten closer to the end, the admonishing has gotten louder and more forceful. Well, now that we have a winner, I won’t be wagging any fingers at the electorate. Because I’ve been tasked with attending to the healing process, and also because I think you guys got this one absolutely right. “Rolling in the Deep” and “Hey Ya!” absolutely deserved to be the last ones standing, and “Hey Ya!” deserved to win. This is true because this is what ended up happening. This bracket was set up to determine the people’s choice, and the people have spoken, and the people cannot be wrong. Much of the conversation about this bracket — and there was a lot of conversation, thank you very much for that — seemed to be rooted in a fundamental misunderstanding of what the word “best” is supposed to mean in this context. “Best” was commonly misconstrued to be synonymous with “favorite” or most personally relevant, as in “‘Sk8er Boi’ is obviously the best song of the millennium because it instantly reminds me of what it felt like to be in the eighth grade.” This definition of “best” inherently resists consensus, because it exists in a vacuum. You can’t “prove” it, because it’s based solely on your own experience. It’s like arguing over whose mother makes the best meatloaf. But all of that barely matters now. We got the right result. 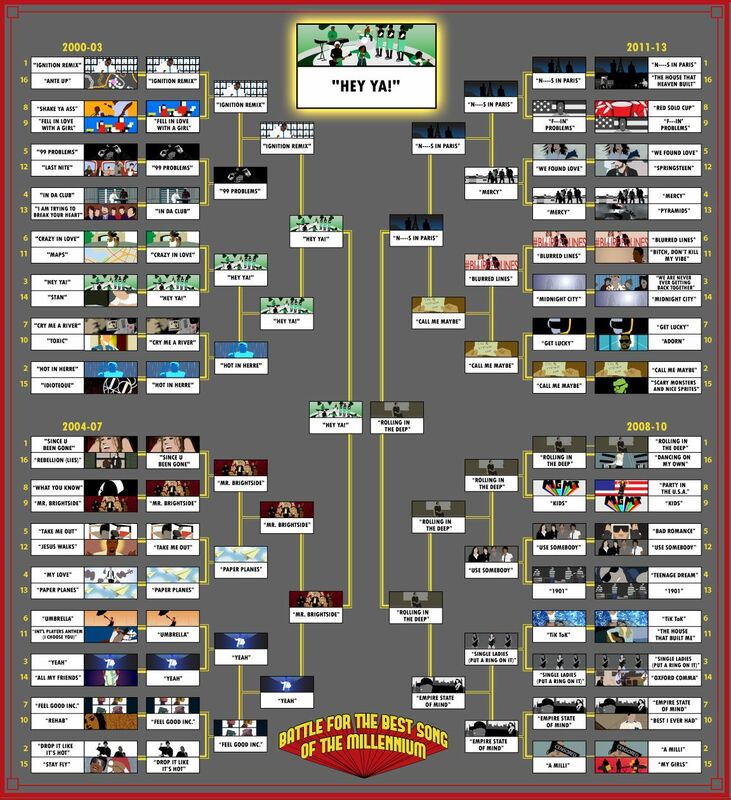 If you had asked me last week which two songs in the bracket had the broadest base of support, I would’ve said “Rolling in the Deep” and “Hey Ya!” It hardly takes a genius to make this observation. “Rolling in the Deep” is the most popular song from the biggest-selling album of the last several years. “Hey Ya!” is the most popular song from the most universally liked and respected rap group of the last two decades. It seems thunderously obvious that this is where we’d end up, almost to the point of rendering all the voting that got us here moot. These arguments are interesting and have more than a little truth to them. They’re also irrelevant. “Rolling in the Deep” and “Hey Ya!” were the right songs precisely because they don’t appeal just to the fans. They appeal to everybody. You might think you hate one or both of these songs, but you probably had to decide to hate them, and it likely had something to do with the fact that everybody else thinks they’re awesome. That’s on you, not Adele or OutKast. When I got married five years ago, my wedding reception felt like one of those surreal dreams where your best friend from grade school is suddenly your boss at your first job out of college. People from every section of your life are assembled in one place and now they’re drinking and laughing together. It’s an occasion that calls on the ability of pop music to unite people, and no songs have united more people this century than “Rolling in the Deep” and “Hey Ya!” You don’t have to make a case for those songs being as good as “I Heard It Through the Grapevine” or “Stayin’ Alive” or “Bust a Move” — it’s a fact that they all wind up on the same playlists tens of thousands of times around the world every year. I know this is true because you said so with your votes. Frankly, as a person who writes about music for a living and sometimes wonders whether pop’s “mass appeal” period is long gone, I’m happy that songs still have that power. So, no, I won’t scold you. I only have praises. You took what we gave you, warts and all, and did a great job. Even when we said you got it wrong, you were right all along. This, by the way, is my shout-out to “Mr. Brightside” backers: Don’t listen to my grumpy colleagues, pals. That song is awesome. If you put a gun to my head, I’d probably say “Since U Been Gone” is better. But it’s not that much better. Besides, aren’t we talking about two songs that derive from very similar sources? If “Mr. Brightside” is warmed-over Duran Duran, “Since U Been Gone” is warmed-over Patty Smyth. And they both taste delicious! So let’s just put our guns down, grab some champagne, do the funky chicken, and get over ourselves already. For once on the Internet, it wasn’t about me and it wasn’t about you. It was about us.